Yes, I’ve been busy over here! There are Sierra-compatible updates for both App Tamer and Jettison today, with both offering additional fixes and enhancements as well as support for macOS 10.12. 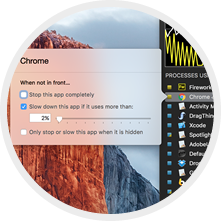 App Tamer 2.2: While I’ll be the first to admit that App Tamer is a bit of a niche product (you’ve got to be a little geeky to like the details of what it does), I’m excited by the improvements in this release. It’s more intelligent about identifying which processes are “helpers” for others, and can therefore do a much better job at throttling all those Safari Web Content processes when it limits Safari’s CPU usage, for example, while still letting the Mail Web Content helpers run at full tilt for Mail (if that’s what you want). App Tamer’s basic process management is also more efficient now, so it all adds up to it doing its job better. If you’ve got apps that are sucking down CPU (and battery!) while they’re sitting in the background, App Tamer can help you out. More details and download links are on the App Tamer What’s New page. Jettison 1.5.1: The Jettison update addresses issues with Sierra, and also gives you the option to unmount rather than eject drives when your Mac sleeps. “Why do I care?” you say? Well, I’m glad you asked (and you might be too)! Some SD cards and Flash drives won’t remount properly after being ejected, even when Jettison reloads their device drivers. That can result in you having to do a really inconvenient little dance of unplugging them and plugging them back in to get them to show up. Turning on this new option in your Jettison prefs avoids that. There are also bug fixes for Jettison’s handling of network drives, removal of some logic that checked whether the display was going to sleep before ejecting disks (long story – it did solve a problem, but created even more in the end), and tweaks to better handle OS X’s propensity to report errors when there are none. Go visit the Jettison What’s New page for a list of changes and download links. Version 5.0.6 of Default Folder X is officially out! It’s the product of a lot of bug-chasing and wrangling of little details, especially where Sierra is concerned. I know there are still features that some of you are waiting for – I still have a long To-Do list – I haven’t forgotten. 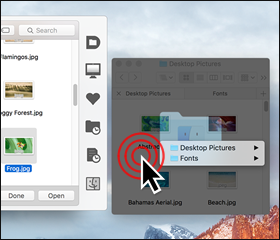 In addition to supporting macOS 10.12, this update delivers a few often-requested features, including the ability to keep your Favorites sorted by name and better interoperability with LaunchBar. It also addresses some occasional glitches and compatibility issues, and starts up more quickly than previous versions. If you’re running Sierra, El Capitan or Yosemite, you should update to this version, as most of the improvements apply to all versions of macOS, not just Sierra. There’s a full change list and download links on the Default Folder X What’s New page. Have at it! And stay tuned for updates to App Tamer and Jettison as well – they’ll be here shortly. There’s a new public beta of Default Folder X that addresses issues with the latest beta releases of macOS 10.12 Sierra. I’m also testing some changes to Default Folder X’s activation method that get rid of problems with it occasionally not loading in some applications, as well as fixing a hang that could occur under some circumstances. Oh, and there’s also improved support for LaunchBar. You can see the full change history and download a copy from the Default Folder X Testing page. If you’re running App Tamer, make sure you get a copy of the latest App Tamer Beta too.